Throughsculptures, installations and brand-new paintings made from large scale murals Masai has created worldwide, Masai’s new exhibition Missing is a compelling commentary on the threats to biodiversity across the globe. In his latest works, bees (animals threatened on our very soil) appear as the agents for survival, stitching up patchwork plush toy versions of those animals soon to be missing. Elements of immersion and interaction create a riveting experience by plunging the viewer into a forest of bees, full of the scent and buzz of live honeycombs. In his latest exhibition, aptly titled Missing, Masai showcases a selection of brand new paintings, sculptures and installations, each focusing on endangered animals in specific regions across the globe, from the South African penguin to the humble bumble bee threatened on our very soil, whose existence in the ecosystem supports our own ongoing survival and which is yet increasingly threatened through pesticide waste. In his latest works, bees appear as agents for survival, stitching up patchwork plush toy versions of those animals soon to be missing from our biodiversity. 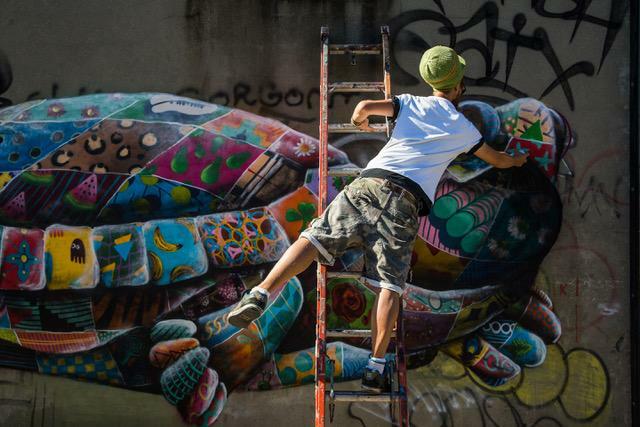 Missing follows from Masai’s successful 2016 tour of the United States, The Art Of Beeing, where he painted over 20 murals of species under threat in 12 cities across nine states in just two months. 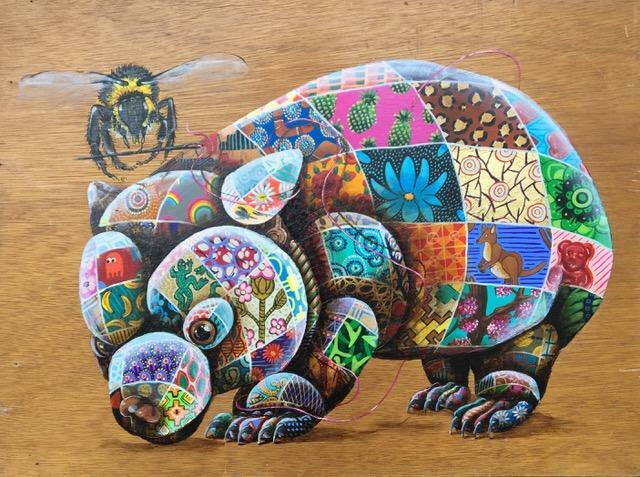 Each piece will be a brand-new painting created from large scale murals that Masai has created worldwide, coupling each animal with the region its native region. The title is also a reference to ‘missing’ posters seen stuck on trees, milk cartons and lampposts throughout the world, a way to engage the viewer with something we as a society may walk past on a nearly daily basis. Held in the one of the most atmospheric exhibition spaces in London, Euston’s Crypt Gallery, the show will run between the 25th to the 27th May, with a private view on the 24th. Masai will combine displayed works with elements of interaction and immersion, plunging the viewer into a forest of trees, full of the scent and buzz of live honeycombs. These elements help to highlight one of the artist’s key messages, that these interventions and endangerment issues are much closer than we might otherwise think. Held in a space associated with death and burial, Masai’s work takes on a poignant urgency; if we do not act, these animals too may soon be nothing more than ashes and dust. Works in the show include a specially created animatronic penguin, built with a robotics specialist, that stands atop an oil drum, a slick black pool collected at the base. Masai says: "Climate change is in full effect, with one of the major factors being the '6th Mass Extinction'. Species are becoming extinct or missing in our biodiverse world.This is a real issue that we face as humans, and as an artist, I feel it’s my duty to draw attention to this issue. Through my work I hope to remind people of the urgency we face, highlighting our place amongst creatures who are a critical part of our delicate ecosystem”. Exclusively made t-shirts with designs from prints featured in the exhibition will be on sale during the exhibition, the profits of which will support Emmaus charity. For centuries, we have been setting up physical and metaphorical barriers and borders between ourselves and the wildlife surrounding us. Masai’s work highlights the vast, longstanding and ultimately irreversible impact of our ways, in the hopes of catalysing a new way of being across all species, including our own.